The Arboretum is open to the public from dawn to dusk. Admission and parking are free. a covered gazebo with seating. We invite you to enjoy all that our five acres of gardens and 30 acres of forest trails have to offer to you. Stroll, jog, bike or just wander. We have a few rules that we ask all visitors to follow. The public is reminded that fireworks, dangerous weapons as defined by RCW 9.41.250, open fires, camping, alcohol and drugs are not allowed in the park. Leash and scoop laws apply to pets. Dirt bikes and ATVs are not allowed on Arboretum grounds and, although passive recreation is allowed in our meadow, no organized sports are allowed on the grounds in order to protect our gardens. No fires or grills are allowed in the forest or forest ring without express permission from the Maple Valley Parks & Recreation Department. Please help to protect our plants by staying on the garden paths. Well-mannered dogs are always welcome. We only ask that you do your best to keep them from causing any damage to the grounds or wildlife. Two Doggie bag stations are located on the property. All developed parts of the garden have stroller- and wheelchair-accessible garden paths. One set of stone steps are not wheel-chair accessible, although there are alternate routes around it that do accommodate wheelchairs. Undeveloped parts of the garden, including the Regional Trail and the Forest Reserve, are not wheel-chair accessible. 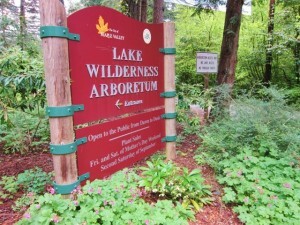 For more details, please see our online Arboretum map or the maps at the kiosks in the Arboretum. Lake Wilderness Arboretum is located in Lake Wilderness Park at 22520 SE 248th in Maple Valley, WA. Building a sanctuary to inspire, educate and connect us to the natural world.